Code Browser Portable is a handy and reliable utility created to hierarchically structure text files and especially source code ones. It makes navigation through source code faster and easier. Code Browser is especially designed to keep a good overview of the code of large projects, but is also useful for a simple css file. Ideal if you are fed up of having to scroll through thousands of lines of code. Several files can be loaded simultaneously, but in addition, several windows can be opened on the same file. This feature is very important with the folding system: It allows viewing or editing another part of your current working file; you just have to reopen a new window on it. Working with source code can imply thousands of individual lines that can't include errors, however, browsing that much information can be difficult and time consuming. 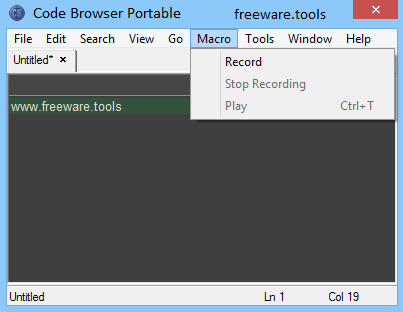 Code Browser Portable is an application that allows users to organize code files into a hierarchical structure that makes it easier to navigate and work with. A code browser can be a complicated and difficult application to use at times, the program has managed to avoid that problem with a very efficient design. The interface is not held back by an overwhelming number of icons or buttons on display, but rather a simple toolbar with well constructed menus. Every option that is needed, including the ability to make new tabs or side bars or dividing the main window, it is all accessible. The simple and straight forward design makes the main feature of the application clear, users can organize code to make it more accessible. The application automatically structures it with a series of expandable areas, making it far easier to go through large amounts of text. Each area can be expanded with a click, to be studied and looked at, then checked for errors. With multiple display options to change the way it is presented. The application operates mainly by folding groups of lines into sections, making them easy to hide or expand depending on the user's needs. Users can then create links to navigate between different areas or files and connect different sections together. Since the application can handle multiple files loaded simultaneously, different files can also be linked together, or a section of a file pulled into a new tab. This process means that sections and files can be edited or browsed independently from one another, yet linked together via the application. A multitude of different display and viewing tools are available, users can choose to display the various file sections in a tree browser view, with either a horizontal or vertical approach. To conclude, the application is a useful tool, while its editing abilities are limited, it allows users to restructure a code file to make it more efficient. The folding text into a section function is very useful and, for users with large amounts of code to handle, the application is a useful, free tool. All in all, Code Browser Portable is a great addition to any coder’s toolkit.